By David & Wanda S.
"Nate is having concerns about my water heater base, some of the cement has broken away." "I chose your company after seeing the good online reviews, noticing that you were registered at BBB, and for your friendly staff..."
"Ken came twice, gave me a less expensive alternative, addressed my requests." Ken came twice, gave me a less expensive alternative, addressed my requests. "Great Price - Ken was also great. No pressure on the sales. Dom and Sheldon did a great job. May need to have other services done..."
Great Price - Ken was also great. No pressure on the sales. Dom and Sheldon did a great job. May need to have other services done by Ayers. Usually I would call multiple companies to make a sound decision on which service providers to use. In this case, due to the professionalism and information presented, I used Ayers without other investigation. Definitely a compliment to your internal staff. Making your home truly beautiful is important to you, and Ken’s goal is to help make it healthier and more comfortable. Ken completed extensive training in designing solutions for your waterproofing, foundation, and crawl space repair needs. This includes earning the Certified Waterproofing Professional designation through the Basement Systems International Network of Waterproofing Contractors. He brings a comprehensive, personalized approach to every job. Ken will give you a custom solution based on your goals and exactly what’s going on in your home. His customers recommend Ken and the Ayers Team to their family and friends. Since 1985, Ken has been “chasing water” in the construction industry. His experience includes roofing, siding, and windows; however, his favorite projects have been helping families solve the water issues in their homes. Ken has taken many courses in construction project management, residential building codes, and green buildings. Originally from Jackson Michigan, Ken now resides in Brooklyn, Michigan with his wife Sandy and their four children. He is an avid golfer and enjoys spending time with his children and grandchildren. After a questionable foundation repair to this Cement City, MI home, the owners began to notice that they’re basement didn’t look quite right. There were cracks in the foundation and front porch. Not to mention, both the floors upstairs and porch seemed to be sagging and uneven. In other words, the foundation was starting to settle. The owners wanted to keep their basement separate from the upstairs for a little while longer, so they made a call to the basement and foundation experts, Ayers Basement Systems. To fix this settling foundation, the crew used SmartJacks. The jacks are usually used to repair the floor above sagging crawl spaces, but thanks to their adjustability, the jacks were perfect for this low basement ceiling. Similar to the installation process for crawl spaces, the SmartJacks were attached to previously installed reinforcement beams in the ceiling and lodged into the concrete slab at floor level. The SmartJacks will reduce the amount of stress on the foundation and stabilize the ceiling back to its original position. 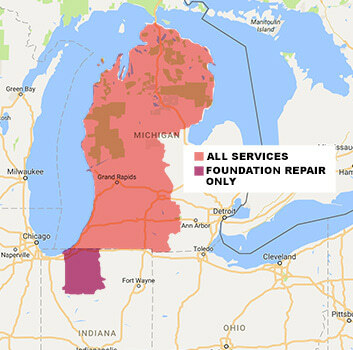 If you’re interested in a foundation repair, then give us a call for a free estimate! A crawl space moisture problem called us out to this Cement City, MI home. The owner thought there might be moisture in the crawl space, but he wasn’t sure. He did know that he wanted to waterproof the entire area and his basement, too. After completing the waterproofing, the team installed 3 vent covers for the new crawl space. The benefit of a cover is that things are kept out. Critters, moisture and air, hot or cold, can enter through an open vent at any time. Our vent covers create an airtight seal that will keep this newly encapsulated crawl space clean and protected. This crawl space had suffered some minor termite damage in the past and signs of some moisture in the crawl space were evident. We were able to help remedy the issues under this home by sistering some joists to ensure the strength of the structure. We also encapsulated the crawl space using our durable CleanSpace material. This material covers the ground and is carried up the walls and around piers to create an effective moisture barrier. We also installed SilverGlo insulation on the wall to reflect heat back into the crawl space during the cold months and increase energy efficiency. Lastly, we spray foamed the rim joists which are a common entry point for humid air. This helps to create a cleaner, dryer, brighter, and healthier space under the home. This home was built in 1920, so the crawl space was not exactly an ideal one. There was also evidence of a termite infestation, and mold was growing in multiple spots. Needless to say, this crawl space was due for a major upgrade. Luckily for this Grass Lake, MI home, we have the perfect solution: our CleanSpace Vapor Barrier Encapsulation system. CleanSpace is a plastic liner that is designed to permanently keep away any moisture, air, or pests. It is placed completely over the walls and floor, creating a constant blockage to anything outside of it. Thanks to CleanSpace, this homeowner can say goodbye to pest and mold problems. Lucas from Grass Lake, MI was having water issues in his basement. His sump pump had been running full time the entire fall, and water was beginning to seep through the floor around where the sump pump was. In order to stop water from seeping in and preventing further damage, we decided to install our TripeSafe Sump Pump. TripleSafe has three sump pumps that all fit into one liner. This is important because three pumps won’t become overwhelmed with higher pumping demands like a single pump would. Also, if the power goes out in your home, the third pump serves as a battery-operated backup, meaning that it will take care of any business that needs to be handled until the power comes back on. Lucas' old sump pump simply couldn't handle all of the water that was coming in, but with TripleSafe, no amount of water is ever too much for this beast. In terms of waterproofing your basement, there simply isn't a superior option to our TripleSafe Sump Pump. The CleanSpace Encapsulation System protects your home from mold and rot. Do you have sagging, sloping, or uneven floors upstairs? The problem could be in your crawl space. SmartJack Crawl Space Stabilizers support your floors by pushing them upwards back to their original positions. The homeowners had water coming into their basement through the floors. The water was getting so bad that it started pooling on the floor and damaging it. Our professional team decided that the existing sump pump was not enough. They installed the TripleSafe sump pump to combat the water. The TripleSafe has three sump pumps in one so you have triple protection! The first pump will remove water from your home effectively. The second pump has a seperate discharge line and is more powerful. The second pump is there for you in the rare ocassions that you need it. The third pump is equipped with batteries and is there for you if the power goes out. The before picture shows the pooling water in the basement and the after picture shows the TripleSafe sump pump. Any diversions from a flat surface in your yard - hills, valleys, slants - can cause headaches when it comes to water. Our customer called because the slant to their driveway was helping water drain toward the house instead of away - sometimes it seemed to be coming right from the floor. By installing TrenchDrain in the driveway, water can drain through the grated opening and divert to an outlet in the yard, far away from the house. Our customer called after buying a house and realizing that the existing sump pump was not up to snuff. We replaced it with a TripleSafe sump pump and installed IceGuard on the discharge lines to protect against freezing lines next winter. This basement would leak down the walls after heavy rains and onto the tile floor. As you can see in the before photo, the wood panels had a bit of water damage towards the bottom of them. To help repair the problem, the crew installed a WaterGuard perimeter drainage system at the foot of the walls. They cut the bottom portions of the walls to remove the stains. Before the perimeter system could be installed, the tile and floor needed to be excavated to make room for the pipes. The after photo shows where fresh concrete was poured to cover the system and the SuperSump system that will pump out any water in the WaterGuard. With those two systems, there will be no more leaks in this basement. The before photo shows the unprotected crawl space and where moisture would come through the dirt floor and walls. Around the edges of the crawl space, water had started to puddles up and dampen the dirt floor. The walls had also started to stain from moisture. CleanSpace vapor barrier was the solution to keeping water out and improving the living conditions of this home. The moisture liner blocks out water and won’t allow for mold growth either. Also seen in the after photo are the SilverGlo panels and FrothPak insulation. SilverGlo wall panels and FrothPak are a form of insulation that keeps out air and humidity. All three products create an airtight seal that won’t allow moisture or imperfect temperatures to enter. Do you plan on spending more time in your basement, maybe making a bedroom or playroom down there? Well, it's important that your house is up to code and safe with two exits in case of an emergency. The door is one exit and an egress window makes for the perfect second exit. We completely install the egress window/cover and do all the work for you. This will give you and your family peace of mind and helps with the resale value of your home if you ever want to sell it. Jay called us because this past spring he had a foot of water in his crawl space. He had a good feeling it was because his sump pump had failed so we checked it out and came up with the best solution for Jay and his home. Our system design specialist after a thorough inspection decided to install our vapor barrier and a new sump pump. Our vapor barrier is called the CleanSpace system. It is a very thick, plastic material that will keep all outside elements (dirt, bugs, critters etc.) outside. CleanSpace is also durable enough that it can be walked on, crawled on, have stuff stored on it and it won't rip or stretch out. We highly recommend vapor barrier, it keeps your basement dry and makes it more appealing. When finishing your basement, especially if you're turning it into a bedroom or otherwise habitable living space (i.e. an apartment), it's important to be aware of building code. You must have a properly sized window, like the egress windows we install. While finishing their basement, our customer had us install a new egress to take the place of their small, outdated basement window. You'll have to look closely to even see it in the before picture. The difference is dramatic. Alan M. of Jackson, Michigan lives in an old farm house over 100 years old built from stone walls. The stone walls had led to leaking water into the basement, and Alan needed a solution fast. We installed the WaterGuard French drain system and the SuperSump premier sump pump system. WaterGuard rests below the basement floor and above the foundation footing. This placement is made in order to catch all the water that seeps into the basement from the walls. Once this water is collected, it is redirected into the sump pump, in this case, the SuperSump, to be pumped up and out of the home. The homeowners in Jackson, MI had water coming into their basement where the floor and the wall met. The water was starting to pool in some areas and started causing damage to their basement floor. They knew they needed to fixed the problem so they called Ayers Basement Systems. To combat this water our professional team installed our WaterGuard long lasting interior perimeter drainage system. The WaterGuard system sits on the top of the footing in order to prevent clogging from mud or debris. The system works by capturing water seepage from the floors and walls before it has a chance to damage anything. Once the water is trapped in the drain it is immediately directed to the sump pump. The sump pump then removes the water from the home keeping your basement clean and dry! The before picture shows the WaterGuard system put into place and the after picture shows the system after it is alll installed and covered with a clean layer of concrete. Our professional team also installed the TripleSafe sump pump. The TripleSafe is three sump pumps in one giving you triple protection. The first pump will effectively and efficiently remove water from the home. The second pump has a seperate discharge line and is more powerful. The second pump is there for you on the rare ocassions that you need it. The third pump is equipped with batteries and is there for you if the power goes out. The TripleSafe switches automatically so you do not need to worry about anything! The homeowners in Jackson, MI had a crawl space that was already waterproofed, but water was still getting into the area somehow. There was not a ton of water, but it was enough to cause concern. In order to stop this water our professional team installed the SuperSump sump pump. The SuperSump is a full featured system containing the best componently available. It includes the SuperLiner, which is an airtight lid that looks more attractive, keeps pests out and eliminates safety hazard of an open sump pump. It has a floor drain in case an unforeseen accident puts water on your basement floor. It includes a WaterWatch Alarm, which alerts you if the water level rises above the sump pump intake. It has a cast-iron pump to prevent overheating and burnout. It has a CleanPump pump stand that elevates the sump pump to prevent clogging. It has a check valve to prevent pumped water from re-entering. Lastly, it has an improved float valve to ensure long term performance. The before picture shows the old sump pump and the after picture shows the SuperSump sump pump. The homeowner in Jackson, MI was having an issue with some water entering in the basement. Unsure why water was entering the basement, one of our System Design Specialist took a look at the issue. After evaluating the problem, the best solution to the issues happening were to install our French Drain System along with a TripleSafe Sump Pump. The TripleSafe Sump Pump adds three levels of protection for your basement. For basements with no sump pump, this is one of our many pumps that we offer that will give you peace of mind if any water finds its way in the basement. The TripleSafe Sump Pump extracts 2,220 gallons of water per hour at an 8-foot head. A customer in Jackson approached us with a wet crawl space that needed help before it would be invaded by mold. Luckily, we had just the fix to keep this homeowner's basement dry from the outside enviornment. We installed our moisture fighting CleanSpace system. CleanSpace is a 20 mil thick plastic liner that fits to the crawl space to completely seal the home from the earth. Polyester cord reinforcement allows for a lot of durability, to make it last longer than the home will. This liner also contains an antimicrobial additive to prevent mold. This liner should also be combined with CleanSpace vent covers to insulate and seal the air out. Our customer Greg, from Jackson, MI had standing water in his crawlspace. Greg also admitted that he was worried about the sagging support beam below his home. He saw an Ayers Basement Systems truck on the highway and wrote down our phone number. He was hoping we were the local experts that could end all of his crawlspace struggles. Greg gave us a call one morning. After assessing Greg’s crawlspace needs, we installed our patented CleanSpace crawl space encapsulation system to address the current moisture issues being faced below his home. The CleanSpace encapsulation product is a thick plastic lining that completely seals off the crawl space from the ornery elements it faces below. The CleanSpace drainage matting we installed will allow the water to easily flow to the Super Sump. The Super Sump is a budget conscious sump pump system that contains an air tight lid, floor drain, pump stand, and a pump alarm. These are the essential features needed to help keep a basement dry. We also determined that Greg’s foundation needed additional support. To supplement the CleanSpace and support his home we installed three Smart Jacks. The Smart Jack is a supplemental support system for crawl space applications. The Smart Jack effectively supports sagging beams and floor joists caused by, a length of span greater than spanning capability, floor load increased after construction, exceeding design values, and weakening over time due to high moisture and rot. With this completed system in place, it became evident that Greg’s cranky crawlspace was no match for our level of expertise. WaterGuard is designed to be installed below the floor slab, resting on top of the foundation footing. This keeps this drainage system out of the "mud zone", where drains can clog. The WaterGuard french drain system is installed above the "mud" zone so it won't get clogged. Once the installation is complete, concrete is laid down to make the installation seemingly unnoticable. This Mason, MI home had cut stone foundation walls which were constantly leaking water into the basement. Frustrated, the homeowners contacted Ayers fora waterproofing solution to their problem. We visited the home and got right to work installing WaterGuard around the perimeter of the basement. This subfloor drainage system sits on top of the footing, and collects any water that might enter through the walls. The water is then rerouted from WaterGuard to the sump pump where it’s then pumped out of the basement and away from the nome. Now these Mason residents can have peace of mind knowing that WaterGuard has got their leaky walls handled. Drew called after buying a new home with a few basement issues. For one, a basement wall was tilting one to two inches. He also had some wet basement issues. Originally, Drew called thinking that he was going to be getting an estimate on excavating outside the home, fixing the wall, back filling and repairing the concrete driveway that would have to be ripped out in the process. Fortunately for Drew, the process was much easier. We ended up installing a series of six PowerBraces along the tilting wall. These braces are I-beams which extended from floor to ceiling and help prevent the wall from tilting any further. They even have a unique tightening feature that gives the potential to improve the condition of the wall over time. At the same time, we waterproofed the wall by adding our WaterGuard perimeter drainage system along the base of the wall. Concrete is excavated around the base exposing the home's footing. The drain is placed along the footing and drainage stone is filled around it. The concrete is then replaced over top. The drain leads to a sump pump which safely removes any water that gets gathered along the base of the wall. Installing both PowerBraces and WaterGuard at the same time allows us the chance to secure the braces to the home's footing and then place concrete around the bottom of the brace, giving it greater strength and reliability. No excavation was needed on the exterior and the basement wall is now permanently secure and waterproofed. Unlike fiberglass insulation batts, SilverGlo insulation foam boards shed water instead of soaking it up like cellulose and fiberglass insulation do and foam insulation won’t support mold. The SuperSump includes the finest pump available - a high-end 1/3 HP cast-iron Zoeller sump pump with a mechanical float switch. This pump was chosen as the best from among nearly 50 models. The SuperSump is designed to house a secondary battery backup sump pump, the UltraSump, within the same liner in the event of a power outage or pump failure. This homeowner's basement will stay dry all the time! Cracks in basement walls can be difficult to waterproof when conventional sealants don't stick well and cracks move and expand. We've helped many homeowners who have tried to waterproof cracks on their own with no success. Our team does inject sealants into the crack but this is only a first line of defense. We also excavate a small area under the crack creating a drywell a few gallons deep that water will eventually flow into and leach back into the soil. The drywell is filled with crushed stone and the concrete on top is replaced aside from a small gap at the base of the wall where the water is allowed to seep in. The crack is covered with a foam followed by a mold and mildew resistant layer on top. The foam creates a space between the wall and mold resistant layer where water can flow freely into the drywell in the event that the sealants begin to fail. The homeowner will never have to worry about puddles. They'll likely not even know whether the crack is leaking or not. The shop vac can now have a much needed break.